An exhibition of commodities connected to the 300-anniversary of St. Petersburg has been opened in the Administration of the Committee of the economic development, industrial policy and trade. “This exhibition has been organised by the Committee in order to introduce the commodities with anniversary topics to the customer”, maintained the leading market specialist Tatyana Schepkina during the opening. “Now all kinds of products are collected in one place, which offers potential clients the opportunity to view and compare the products”. 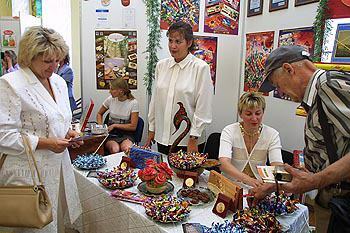 52 companies from St. Petersburg, Moscow, Chelyabinsk, Vladimir and other Russian cities participate in the exhibition. The production of nine of them bears the official symbols of the anniversary, all the others employ the motives of the city decorated for the celebration. 17 companies are food producers, among them “Orimi-Trade” tea, “Nayada” and “Krupskaya Factory” chocolate, “Karavaj” and “Pekar” pastry, “Bavaria” and “Ladoga” beer and “Petrocholod” ice-cream. Other products with anniversary symbols are souvenirs, tableware, watches, posters, articles made of glass and ceramics. Among the companies presenting their production we can find the porcelain company “Suvenirnyj Mir”, Association of handicraft, “Varyag” and others. “It is very important that every guest of our city will have an opportunity to buy these products in shops, hotels, restaurants and bars in order to keep a memory of the anniversary”, said Tatyana Schepkina. City news archive for 02 April' 2003. City news archive for April' 2003.